Note: I am bringing this much-loved sauce to the top of the page for a couple of reasons. First, I linked two complimentary recipes at the bottom of this page. Additionally, I have had several requests recently for recipes that are well suited to give a sick friend or a new mother. I will include links directly below to a few of the recipes I have suggested–recipes that I have often given and that make enough to feed my family at the same time. If you have a recipe that you think is well suited for sharing with someone who could use a helping hand, please feel free to pass it along via email or in the comments section. By mid-December every year, I promise myself that I will start my Christmas shopping earlier the next time around, and sure enough, the following December I have procrastinated all over again. Don’t get me wrong; I love the holidays. But finding the right gifts for the special people in our lives can be a challenge. Enter the gift of food. What thoughtful neighbor or hard-to-buy-for friend wouldn’t relish a break from weeknight cooking, especially during the holidays? Teachers, coaches, and friends might also enjoy a homemade cookie mix, which can be easily prepared after the deluge of Christmas cookies has evaporated. Packaged in a reusable Mason jar, the following two recipes are sure to delight any recipient, yet they need not be reserved solely for gift giving. The ease and taste may make them year-round favorites in your house, too. 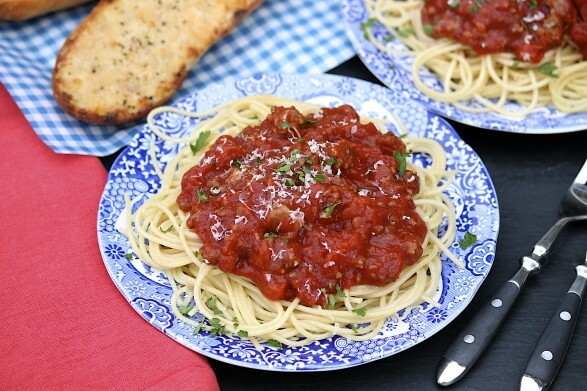 Amazing Parmesan Garlic Bread is the perfect completion to meal, while the Spaghetti Pizza (below) makes a quick meal out of the leftovers. 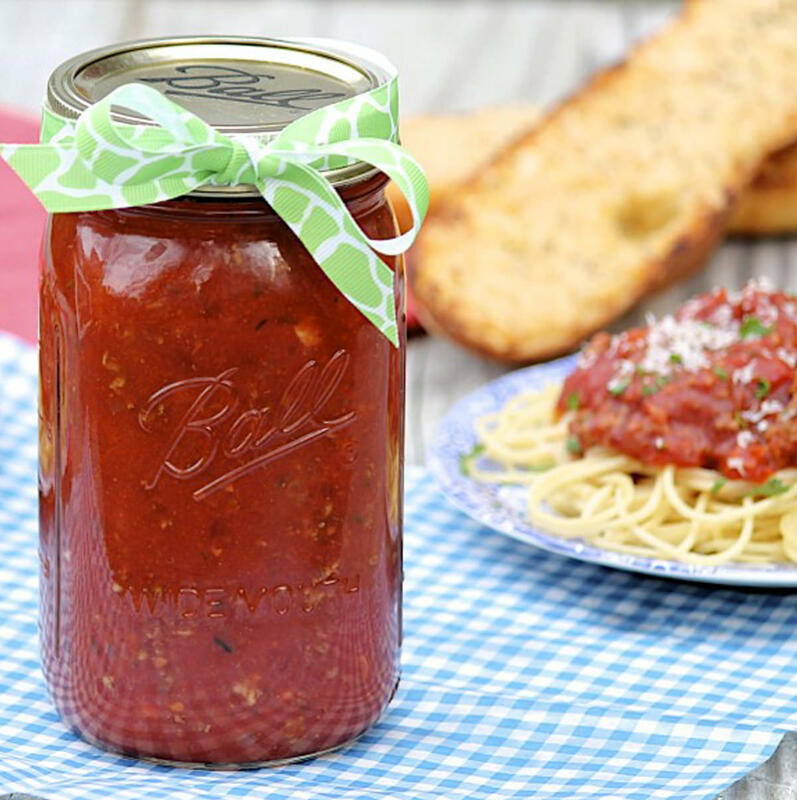 Packaged in quart-size Mason jars, this hearty and healthy sauce needs only a bow for perfect gift giving. This recipe will fill three 32-ounce containers. To make the gift into a complete dinner, consider including a box of pasta and a baguette or some crusty rolls. While this recipe makes plenty to freeze or give away, it can easily be cut in half if you prefer a smaller batch. Brown the ground beef, sausage, and onion in a large skillet or the insert of your slow cooker. Break up the meat as it cooks and add the garlic in the final minute or so, stirring until fragrant but not brown. If cooking in a separate skillet, transfer the mixture to your slow cooker. Add the remaining ingredients, except the fresh basil if using, and mix well. Cover and cook on low for 6-8 hours or on high for 3-4 hours. Stir in the optional fresh basil at the end of the cooking time. Serve over hot spaghetti noodles, or cool and then refrigerate or freeze for later use. My mother and grandmother taught me the importance of adding a touch of sugar to tomato-based sauces. The sugar balances out the acidity of the tomatoes, bringing the flavors together beautifully without tasting sweet. If you like the flavor of onion but don’t care for the pieces in your sauce, cut the peeled onion in half, add to the slow cooker with the tomatoes, cook as directed, and remove prior to eating. Just made it and highly recommend it! Thank you, Kelli. I will stop over your way soon! Another one to try! Going to add to my list Ann! Baking soda works very well taking a stain out of pasta sauce. This sauce is the best. My husband told me to have it for company because it was the best sauce he has ever had. I used breakfast sausage and lean ground beef. Thanks for sharing. That’s such a wonderful compliment, Marsha. Thank you for taking the time to comment! My ancestors were Italian and embracing that I’m trying to find a lot of recipes to make things from scratch. 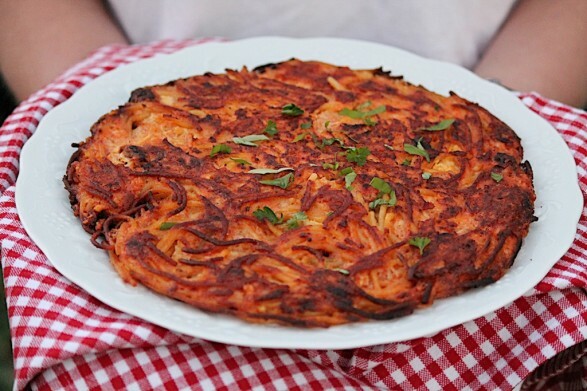 My mom unfortunately is allergic to onions, can this be made without them? You can absolutely omit the onion in this recipe, Amanda! Thank you, I used this recipe but with my tuna casserole instead, this totally saved it and made it taste better than the 1st time. So happy to read this, Susan. Thanks for the great feedback! Is it necessary to brown the meat before hand? I would love to just throw it all into the slow cooker in the morning instead of having to brown the meat. Hi Nina, I have always browned the meat first, but I know people who don’t. Worst case scenario you’d have to break up the meat a bit. Best case you hit on something extra delicious and easy. If you try, please report back! Last night I made your recipe for Roasted Chicken and it was a huge success. I also wanted to mention that last week I used this recipe for crock pot spaghetti sauce. It was my first attempt at making home made spaghetti sauce and it smelled wonderful cooking and was a great hit!! I froze the excess and am going to add meatballs for an easy meal this weekend. My next recipe to try will be your garlic parmasean bread. Thanks for the inspiration you have given me to cook more and use leas take out. I’m happy you’ve made several of my recipes and enjoyed them, Susan. Thank you for your very thoughtful feedback!